This essential Middle English textbook, now in its third edition, introduces students to the wide range of literature written in England between 1150 and 1400. 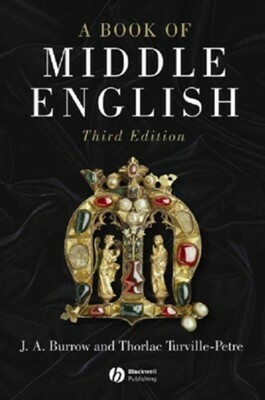 New, thoroughly revised edition of this essential Middle English textbook. Introduces the language of the time, giving guidance on pronunciation, spelling, grammar, metre, vocabulary and regional dialects. Now includes extracts from ‘Pearl’ and Chaucer’s ‘Troilus and Criseyde’. Bibliographic references have been updated throughout. Each text is accompanied by detailed notes. J.A. Burrow is Emeritus Professor at Bristol University. His many publications include Medieval Writers and their Work (1982) and Gestures and Looks in Medieval Narrative (2002). Thorlac Turville-Petre is Professor of Medieval English Literature at the University of Nottingham. His previous publications include England the Nation (1996) and The Piers Plowman Electronic Archive, Vol. 2: Trinity College, Cambridge, MS B.15.19 (CD-ROM, 2000). I'm the author/artist and I want to review A Book of Middle English - eBook.